The Pro-Sort sortation conveyor is designed for high speed sorting of products in warehousing and distribution centers. Products are transported on flight tubes where at a predetermined location, divert shoes move diagonally across the conveyor to physically push the product onto a take-away line. 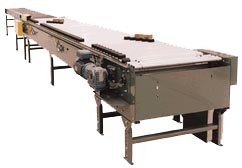 The conveyor's family of models has been developed for sorting small to large items. Overall widths: 24-, 30-, 36-, and 42-in. Bed: 14-in. deep × 1.5-in. ; 10 and 12 gage formed steel frame powder painted. Motor: 230/460V-3Ph, 60HZ, horsepower based on speed and length requirements. Capacity: maximum load 25 lb/ft; maximum unit load 50 lb. Overall widths: 33-, 39-, 45-, 51-, and 57-in. Bed:17-in. deep × 1.5-in. ; 10 and12 gage formed steel frame powder painted. Capacity: maximum load 50 lb/ft; maximum unit load 100 lb. Hytrol Conveyor Company, Inc., 2020 Hytrol Drive, Jonesboro, AR 72401. Tel: 870-935-3700. Fax: 800-482-2798.